Crown Shy has taken up residence at 70 Pine Street, an art deco skyscraper that harkens back to Wall Street's boom. The restaurant features a full bar for walk-ins and a main dining room with floor-to-ceiling windows, simple yet elegant seating, and an open kitchen. 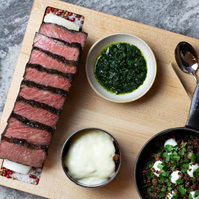 At the helm is former Eleven Madison Park chef James Kent and his partner Jeff Katz. Look for dishes like Red Snapper Crudo with citrus and sesame tuile; Charred Carrots with Razor Clam Chowder; Roasted Short Rib with braised ends and chimichurri; Charred Octopus with red rice and morcilla, a type of blood sausage. Snacks, including oysters with shiso and cucumber, are also offered. Two more projects that are on the way will offer stunning city views from the upper floors. Stay tuned.